Al Gore likes to present himself as a tribune of science, warning the world of imminent danger. But he is more like an Old Testament prophet, calling on us to bewail our wrongful conduct and to go and sin no more. He starts off with the science. The world's climate, he reports, is getting warmer. This accurate report is, however, not set in historic context. World climate has grown warmer and cooler at various times in history. Climate change is not some unique historic event. It is the way the world works. Not this time, Gore says. What's different is that climate change is being driven by human activity -- to wit, increasing carbon dioxide emissions. Which means, he says, that we have to sharply reduce those emissions. But what the scientists tell us is that some proportion of climate change is caused by human activity and some proportion by natural causes -- and that they can only estimate what those proportions are. The estimates they have produced have varied sharply. The climate change models that have been developed don't account for events of the recent past, much less predict with precision events in the future. To which the prophet replies, with religious intensity, that all debate should be over. Those scientists with inconvenient views should be defunded and silenced. We should replace scientific inquiry with faith. We should have faith that climate change -- "global warming" -- is caused primarily by human activity. And we should have faith that the effects will be catastrophic, with rising oceans flooding great cities and pleasant plains and forests broiled by a searing sun. Even The New York Times bridles at this. After Gore won the Academy Award for his film on climate change, the Times printed an article in which respected scientists -- not Republicans, not on oil company payrolls -- charged that Gore has vastly exaggerated the likelihood of catastrophic effects. When you read the fine print of even the scientific reports that Gore likes to cite, you find the same thing. Gore foresees a 20-foot rise in sea level -- 240 inches. The IPCC panel report foresees a maximum of 23 inches. Gore says that "our civilization has never experienced any environmental shift remotely similar to this." Geologist Don Easterbrook says there have been shifts up to "20 times greater than the warming in the past century." Science says that we should learn more about possible bad effects of climate change and calculate rationally how we can mitigate them. As the economic journalist Robert Samuelson points out, there is little that we can feasibly do in the short term to reduce carbon emissions, though over the long term we may be able to develop substitutes for carbon fuels. As the environmentalist Bjorn Lomberg points out, the Kyoto Treaty that Gore helped to write (but which the Clinton administration never asked the Senate to ratify) would produce very little reduction in climate change at very high cost. But religious prophets are not concerned about costs. 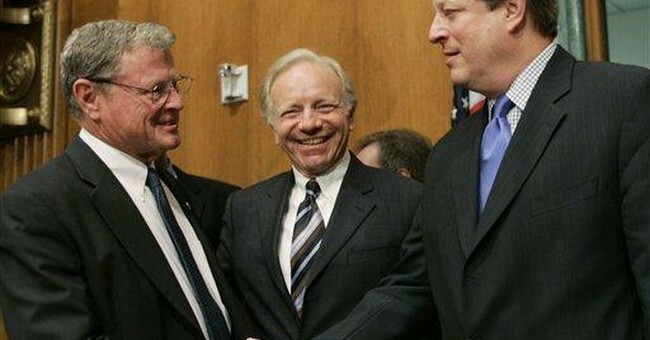 Gore calls for an immediate cessation of new carbon-burning facilities. In other words, stop economic growth. But stopping economic growth in the developing world means consigning millions to miserable poverty. And we know what stopping economic growth in the developed world can mean. Read the history of the 1930s: fascism, communism, world war. There are worse things than a rise of 1 or 2 degrees Centigrade. The natural human yearning for spirituality has produced in many people educated in secular-minded universities and enveloped in an atmosphere of contempt for traditional religion a faith that we vulgar human beings have a sacred obligation not to inflict damage on Mother Earth. But science tells us that the Earth and its climate have been constantly changing. Gore and his followers seem to assume that the ideal climate was the one they got used to when they were growing up. When temperatures dropped in the 1970s, there were warnings of an impending ice age. When they rose in the 1990s, there were predictions of disastrous global warming. This is just another example of the solipsism of the baby boom generation, the pampered and much-praised age cohort that believes the world revolves around them and that all past history has become irrelevant. We're told in effect that the climate of the late 1950s and early 1960s was, of all those that have ever existed, the best of all possible climates. Not by science. But as a matter of faith.